Place all ingredients in a large bowl. Stir well. 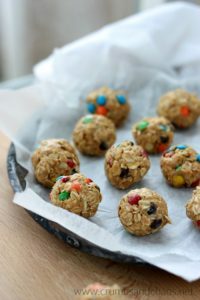 Use a 1 Tablespoon cookie scoop to scoop mixture into balls. Place on a Silpat* lined baking sheet. Use your hands to roll them into smooth balls*. *You could also put them on parchment or wax paper. *If you feel like it's hard to roll them at room temperature, chill them prior to rolling smooth.